Ward is a would-be surgeon … but he is also a competent necromancer, which in this world is a perfectly acceptable occupation. Hired to wake Celia’s corpse long enough for her to say goodbye to her grieving family, he instead finds himself dealing with a risen woman who insists she was murdered. Determined to find out who killed her, Celia flees, dragging the hapless necromancer with her. She won’t stay alive long without his ministrations. Celia views Ward as a naive tool: to be manipulated and exploited, or murdered if necessary. Possibly and. Ward sees Celia as a cold-hearted assassin, as well as a corpse with whom he cannot have a personal relationship. The necromantic code of professional ethics forbids. Romance is unthinkable. Moreover, given the daunting forces arrayed against them, there is no time to indulge in pointless emotion. To quote Evelyn Barber’s comment about Sung in Shadow, you cannot spell necromancer without romance. A year ago, I had no idea necromantic romances were even a thing. But I keep encountering them. Necromancers have ethical guidelines forbidding romancing risen corpses. Which means they need guidelines, because who has rules about stuff that never happens? It’s probably best not to think about this. The author does take some of the edge off by letting us know that Celia is an unusually well-preserved corpse, and that Ward is unusually adept at necromancy. She is not a semi-decayed shambler, but a reasonable facsimile of a living(ish) person. Or perhaps even less dead, since Ward’s necromancy seems to have been unusually effective on Celia. Which, given the growing attraction between the leads, is probably for the best. The novel’s setting and plot—the naive professional entangled with criminals, the curiously bureaucratic underworld of secondary world fantasy settings, the fact that nothing good ever comes of an interest in archaeology—are familiar. Card has fun with them, providing among other things an answer to why governments might tolerate the existence of assassins’ guilds. And her unusually spacious sewers are not pristine subterranean rivers, but actual sewers in which poor Ward spends a lot more time than he would like. or Celia, for her sensible, matter-of-fact stabby conduct. They make a good team: if he follows Celia around, Ward will never run out of corpses to raise. This book is a bit rough in spots, but intriguing enough that I plan to pick up the next book in the series. Just to see where Card takes it. 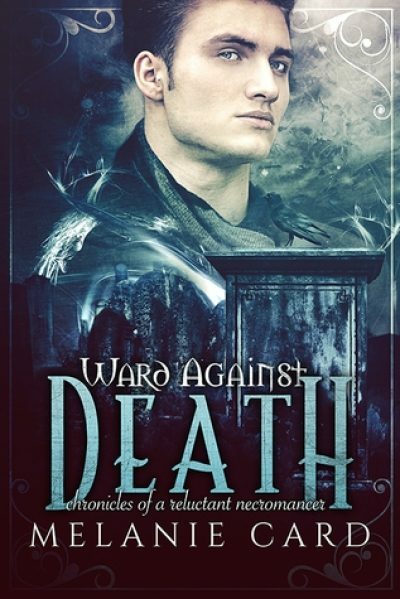 Ward Against Death is available here (Amazon) and here (Chapters-Indigo). 1: The prohibition against surgery may be due in part to the fact this is a secondary fantasy world without any hint that medics know about germ theory or antibiotics. Post-operative infection is very much an issue.